The Equifax data breach is so recent that there's still a lot of confusion about the best security steps to take for protection. Here's a rundown of experts' top recommendations. Between mid-May and July of 2017 cybercriminals stole the personal data of 143 million U.S. consumers by hacking into Equifax, one of the three major U.S. credit bureaus. 1. Assume your data was affected. Equifax offers an online tool for you to check whether or not your data was stolen, but people have reported getting different results when they entered their information more than once. 2. Be careful of what you sign up for. Equifax is offering a free year of their TrustedID credit monitoring service to affected consumers, but initially the language in the agreement appeared to require people to give up their right to sue Equifax. They have now added an opt-out provision, and some attorneys believe the language applied to suing TrustedID and not Equifax - but when attorneys don't all agree it's a sign that consumers should be especially cautious. 3. Consider locking your credit with a security freeze. All three credit bureaus allow you to prevent access to your credit by "freezing" it. A security freeze makes it much harder for thieves to open up new accounts in your name. It typically costs between $5 to $10 to freeze your account with each credit bureau (although read below to find out how to avoid the TransUnion fee), and it can be inconvenient if you need credit checks when you're doing something like applying for a loan or changing cell phone providers. There's a small fee to temporarily unlock your account with each credit bureau. One of the most helpful articles on this topic is by Michael Roub on the DoughRoller website - click here to read it. He is a big fan of security freezes. Roub's article explains that TransUnion's TrueIdentity free (yes, actually free) base level plan allows you to lock and unlock your account online without being charged. It also provides you with access to your TransUnion credit report. Tip: Security freeze fees are often waived for seniors. 4. If a credit freeze sounds like too much, place a fraud alert. Anyone who believes their information has been compromised can place a 90-day fraud alert on their credit files for free. The first credit bureau agency you do this with is required to contact the other two bureaus on your behalf. The fraud alert means that any company opening up credit in your name needs to contact you first. There's no charge, and it's relatively easy to grant access to companies that legitimately need to see your credit history. It needs to be renewed every 90 days, which most people are unlikely to do. Also, there's some disagreement as to the standard of verification that companies are legally required to follow. 5. Be clear on what various resources do and don't do. - Credit freezes and fraud alerts are preventative. They help stop criminals from opening up new accounts, but do nothing to protect the accounts you already have. - Identity theft protection tells you if personal information such as your Social Security or driver's license number is being used in ways that don't show up on your credit history, for example, to open up new utility or medical accounts. - Checking your own financial statements regularly is the only way to make sure you'll detect any suspicious bank withdrawals or card transactions. The Equifax event was basically the Hurricane Irma of data breaches, affecting 44% of Americans. Fortunately, by acting now we can ward off a lot of trouble. 1. Credit Security Freeze: Use the links below to set them up. 2. Identity Theft Monitoring: Reviews.com has what appears to be a well-researched review of identity services. - Click here to read the review. 3. Credit Monitoring: Keep an eye on your credit history, or use an identity theft protection service that includes credit monitoring. - The official place to get your annual free credit report with no strings attached is AnnualCreditReport.com. 4. Track Financial Transactions: Review financial activity regularly, and set automated alerts for withdrawals. 5. Think Long Term: The stolen data will probably be as relevant in ten years as it is today, so keeping on top of things is important. - U.S. home prices rose 5.8 percent year-to-year in June, according to a recent S&P/Case-Shiller report. They rose 6.7 percent year-to-year in July, according to CoreLogic, a data and analytics company. - The national average 30-year fixed mortgage rate is just under 4 percent. The July Pending Home Sales Index dropped 1.3 percent year-to-year, according to the National Association of Realtors®. Note: Housing statistics based on closed sales typically reflect market conditions of two or three months ago. To find out what's going on right now in your local market, please contact me directly. Are you curious about your home's current market value, or do you have a question about home buying? Just reply to this email, or call me at 206-778-4663. Tips on preparing your yard and garden plants for fall. This online tool allows you to opt out of pre-screened card offers for five years. Fun and unusual recipes ranging from Vanilla Bean Whipped Sweet Potatoes to Fig and Prosciutto Flatbread. Just when you thought you'd seen it all, here come two pint-sized tennis competitors to tear up the court in grand style. 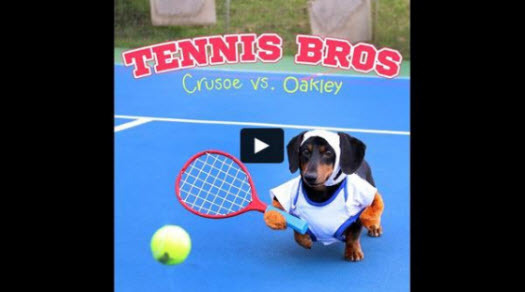 Click here or on the image above to watch the video on Crusoe the Celebrity Dachshund's personal YouTube channel. I welcome the opportunity to serve you, your friends and associates. Please give me a call today or simply reply to this email if I can be of assistance! You are receiving this email because of your relationship with Brooks Beaupain. Please reconfirm your interest in receiving our newsletter. If you do not wish to receive any more emails, you can unsubscribe here. This information is not presented as expert legal or financial advice. Please use your best judgment and consult professionals when necessary. If you are currently working with another agent this is not an attempt to solicit that business.